I have been reading Robert Goddard’s thrillers since acquiring a taste for some palate-cleansing reading-for-enjoyment borne of marathon sessions in the University Library reading-for-eventual-employability. I still have a bitter taste in my mouth if I’m honest, so I keep coming back for more. His ‘Into The Blue’ (1990) is, for my money, right up there with Michael Connelly’s ‘The Poet’ (1996) in terms of how deeply the reader is drawn into the mission of their lone protagonist, winding their way through the story-line with determination and no seeming need to earn any money or worry about the stuff that keeps the rest of us where we are… I suppose it’s a function of hero-worship that each encounter delivers diminishing returns. 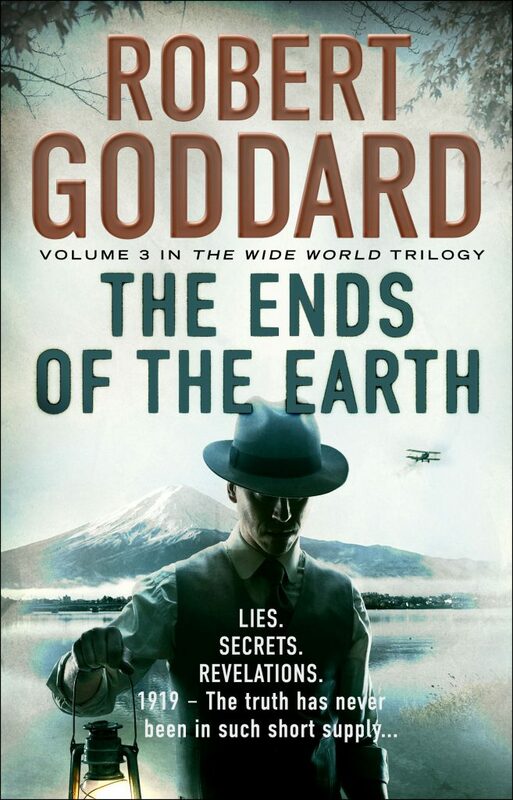 It’s faint praise but nonetheless true to say that ‘The Ends of the Earth’ (Corgi, 2016) did not disappoint me quite as much as some of Goddard’s other recent works have. The novel is the closing chapter on a trilogy set immediately post-WWI, a period which is interesting for its relative obscurity, book-ended as it is by much more obviously dramatic periods. It is curious that the time’s major international story (the ‘flu pandemic which carried off an estimated 50-100 million people) doesn’t really get a mention, but I guess Goddard didn’t see how it added any value or opportunity to his story. There’s very little explicit reference to the realities of life in these times (the lack of automation, difficulties with hygiene, etc) and the rigid class barriers which would have shackled most interactions are winked at but not allowed to interfere with the action. In fact, the starkest reminder that this isn’t taking place in the modern world is the credibility-stretching way in which communications travel between the various theatres of play (telegrams, it seems, are quite as reliable as email – just a bit slower). The hero, a former RFC/ RAF pilot James ‘Max’ Maxted’s fate was left in some doubt at the end of part 2 (‘The Corners of the Globe’) as he sought to unravel the secret of his father’s death at the hands of an international group of conspirators with a motive reaching back into the 1890s. The series explores a grand theme, that apparently inconsequential choices, betrayals and promises can have an influence long into the future. It’s probably not a spoiler to reveal that Max turns up again at the end of the first act to pursue his single-minded objective, with characteristically English determination and self-control. He’s a little annoying, if I’m honest, and I much preferred the character of the weary spy master. As with the best writing set in the past, the author doesn’t inflict pages of exposition or scene setting on their reader, assuming a certain level of background knowledge. You do need to ‘keep up’ (a problem, when a complex trilogy such as this is released a book at a time over a few years – it’s best to read all three in a row) as the plot could not be described as simplistic. I seldom found my thinking jumping ahead of the writing due to obviously signposted twists. Indeed, I had to work quite hard as a reader to maintain the large cast and their interweaving relationships at the forefront of my mind. Equally, the story has made its way to Japan – a country and culture largely alien to the majority of English language readers – and Goddard doesn’t shirk the complexities this brings to the novel, or to his characters. I got the impression that he chose both the period and the setting partly on how under-explored they are in the popular imagination. In the final analysis, I think I failed to connect with the main character enough to care about him or what he was trying to do. Not entirely my fault, his generic blandness was a major factor in this. I suspect the series has done rather well – the ending has been left open enough for the ‘trilogy in four parts’ to become a reality. I’ll no doubt read it.